Highlight Checked-Out Documents, Filter & Sort on SharePoint Linker Properties & Convert Linked Documents into Attachments all with this handy new add-in from Olympic. 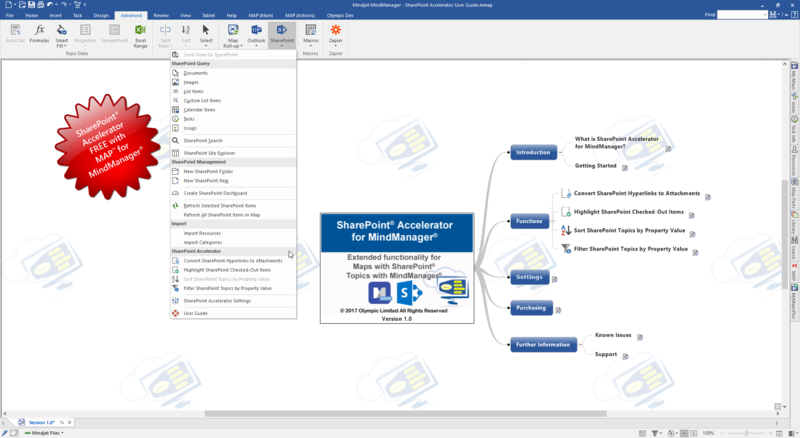 SharePoint® Accelerator is an Olympic add-in designed to help users of MindManager® Enterprise do more when working with Maps and Topics created using the SharePoint® Linker functionality. It is a companion product to our flagship add-in, MAP, which can be installed independently of the core MAP add-in and unlocked using a current MAP license key. When SharePoint Accelerator is installed, additional commands are added to the SharePoint drop-down menu from the MindManager Enterprise Advanced Ribbon Menu. Currently there are four new functions, however more are planned as we expand this SharePoint focused add-in over future releases. Quickly convert the hyperlinked item on a SharePoint Linker Topic to a Topic Attachment so it is available within the Map and accessible where access to the SharePoint server is restricted or unavailable. A great way to also create backups of SharePoint items into a Map for offline storage. You can sort SharePoint Linker Sub-Topics of a selected Topic in either Ascending or Descending order based on the value of a user selected Property. You can quickly highlight and find SharePoint Linker Topics that link to Checked-Out items. Topics can be highlighted by the addition of a Topic Boundary and/or a Topic Icon. When using a Topic Icon the Topics can be accessed quickly from the MindManager Index Taskpane. You can filter SharePoint Linker Topics within a Map either showing or hiding Topics that match the user selected Property value. You can learn more about each of the individual functions in the Help Map available within the 14 day trial or in the Interactive Online Map which can be viewed in any modern browser. Download a 15 day, fully functional trial of SharePoint Accelerator and take ii for a test drive. View the Interactive Online Map to read more about the functionality of SharePoint Accelerator. 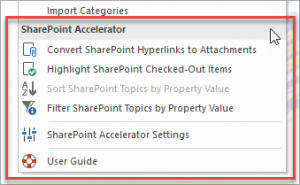 SharePoint Accelerator is a companion add-in for MAP. You can unlock the trial with a MAP 3 license key. Simply purchase MAP 3 to get access to both great add-ins. Visit the store to view license options. Contact us for multi-user pricing or custom quotes. View the Interactive Online Map to learn more about SharePoint Accelerator.